In this era of movie making, certain franchises have a longer shelf life than others. We’ve seen many franchises come and go over the years. 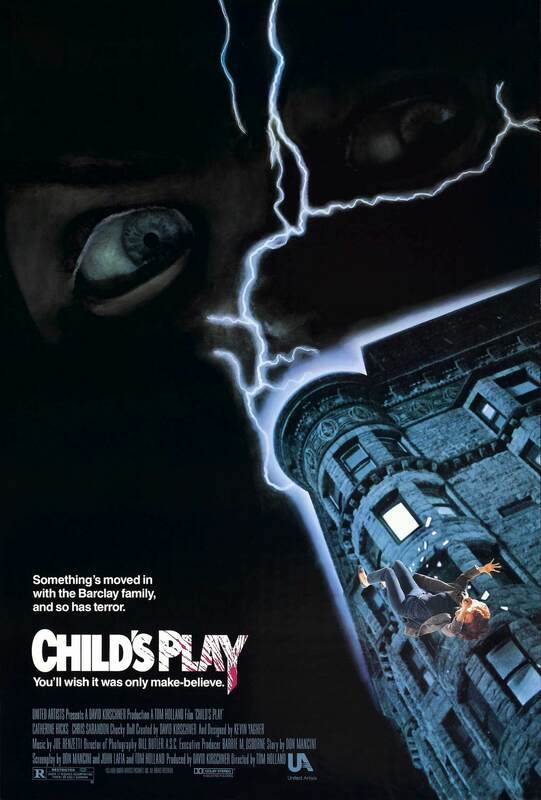 Through the wreckage of many forgettable horror series, one stands alone as the lone survivor of the 80s slasher genre – Child’s Play. While Jason and Freddy have had long series, they have also had remakes, starting the whole series from scratch. 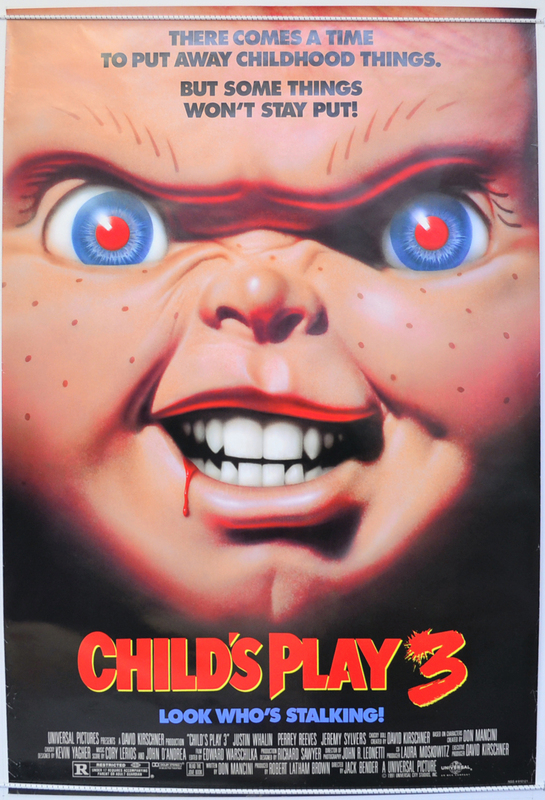 That is not the case with “Child’s Play.” For nearly thirty years, this series has endured, featuring the same creative team and lead actor. This Halloween, I have decided to trace the saga of Chucky, the killer doll, from the beginning, to this years release. Once again, I’ll go movie to movie and give my thoughts on each. I am comparing each movie only to other movies in this franchise. A Chucky movie with a perfect 4 out of 4 is not equal to an actually great movie. This is pretty much the best possible way a movie with this story could go. A movie about a serial killer taking over a child’s doll and going on a killing spree sounds incredibly silly, but it succeeds here. 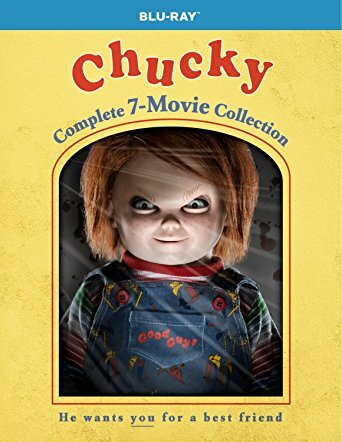 What really makes it work is the fact that the movie holds off on showing Chucky in action until near the end. For most of the movie all we see are deaths occurring, with only hints of seeing Chucky in action. 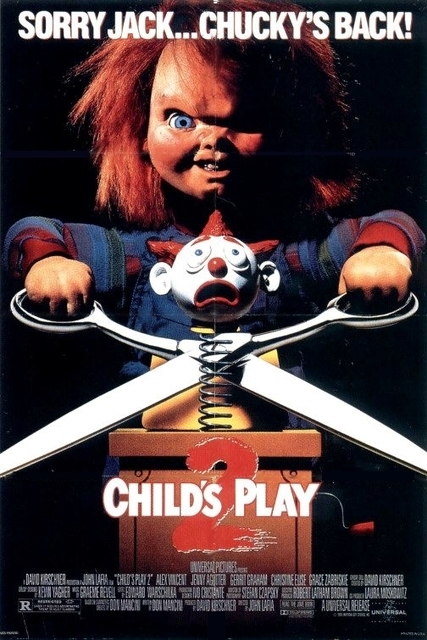 We see Andy talking about how his doll is coming to life and talking to him, but we don’t see Chucky in action until the third act of the movie. For my money, the best scene of the movie is the scene where we see Chucky come to life for the first time, when Andy’s mom threatens to throw him in the fireplace. This scene is made effective by the fact that the movie showed restraint in showing him in action until that point. How many of today’s horror movies have that kind of patience? The whole series would not work without the talents of Brad Dourif doing the voice work. He actually makes this special effect seem like a real character through his performance. Right away, we run into a problem that this and the next movie fall into – it’s just a remake of the first movie. We have Chucky coming after Andy to take over his body, killing anyone that gets in his way. While the plot is formulaic, that doesn’t mean it isn’t well executed. 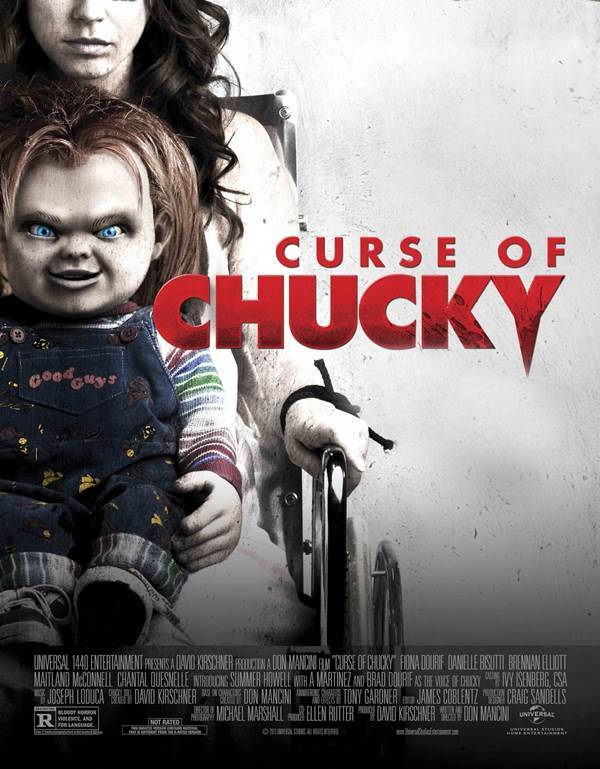 It is an above average slasher, helped by some impressive physical effects on Chucky. The finale, which takes place at a toy factory, is a really great set piece that puts it over the top of most slasher fare. Even if there is a whiff of deja vu about this movie, it is still an entertaining ride. The main problem with this movie is that it is the third variation on the same premise in a row. Chucky is back and tries to take over another child’s body. The difference here is that Andy is not the target, and he is a teenager in this one. This sequel follows the common slasher formula that was commonplace at the time. There is nothing wrong with this in theory, and the staging of the movie isn’t bad at all. I would say that this movie isn’t as bad as the worst of the “Friday the 13th” or “Nightmare on Elm Street” series. The setting is a unique one for a horror film, taking place at a military academy. I do think this gives this movie a certain freshness that the plot doesn’t provide. The setting can only carry this movie so far, as the series is becoming formulaic at this point. It would seem that audiences felt the same, as it would take 7 years to get a follow up. 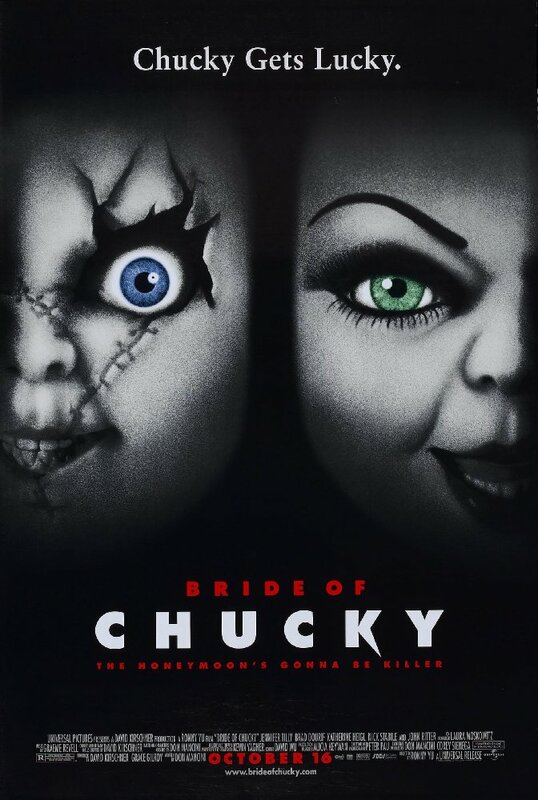 This movie is the reason we’re still getting Chucky movie today. Frankly the formula was already getting old in the last movie. What this movie does is acknowledge the truth that Chucky isn’t that scary. In the post “Scream” era, a straightforward “Child’s Play” movie wasn’t going to work. Giving Chucky a “bride” is the best thing that happened in this series, as is getting rid of the Andy character altogether. There is a certain style to this movie that puts it over the top compared to other horror movies of the time. Ronny Yu, who would go on to direct “Freddy vs. Jason,” directs this with a lot of style that makes it stand out among other horror movies of the time. This movie feels like more time and money was put into it compared with the previous entries. 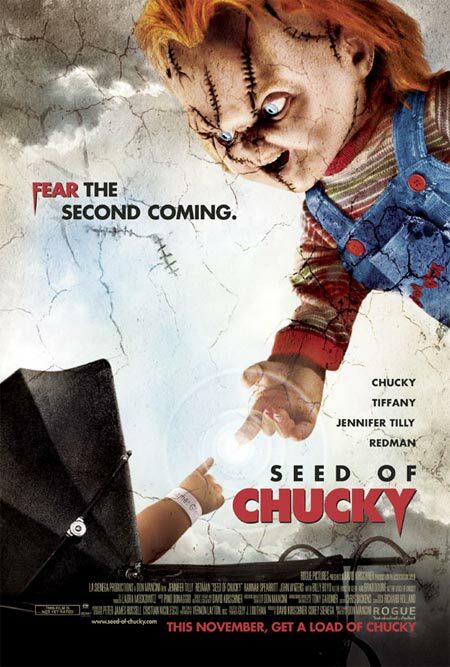 Jennifer Tilly gives a good performance as Tiffany, and the addition of her character also gives Brad Dourif something to play off of, giving him his best performance since the original. The problem with success is that it sometimes makes you double down on the things that worked the first time and go too far. This movie goes way too far in the direction of comedy from the last installment. The meta element of this movie goes way over the top. Not only does Jennifer Tilly return as Tiffany, she also plays herself in the movie, as this makes fun of the movie industry. I don’t know about you, but I don’t go into a Chucky movie wanting to see a Hollywood satire. This movie also looks cheap in comparison to the last movie. It is directed by the screenwriter, who has written all of the movies, and it is not up to the level of the previous entries. It is hard to know where the series could go from here since this movie goes insane in the last act. It would require a change of tone and release strategy to revitalize the series. This movie was a pleasant surprise. Who would have thought a direct to video movie could be this good? This movie wisely pulls back from the outright comedy of the last movie to return to the horror elements of the original. 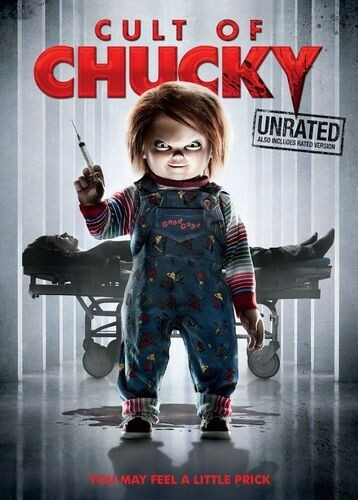 Like the original, the movie holds off seeing Chucky in action until the ending. This movie takes place in one house over the span of a day. The budget restriction works to this movies advantage as the movie has to rely on its story to succeed, and the story is heads and tails above the last one. In this era of remakes and reboots of existing properties, the movie holds its cards close to the vest. Is this movie a follow up to the previous movies, or is it a new beginning? By the end of the movie all of the questions are answered in a really satisfying way. The movie is anchored by a very good performance by Brad Dourif’s daughter, Fiona Dourif as Nica, the wheelchair bound heroine. This movie continues the momentum established by the previous installment. This direct to video trend may add life to the slasher genre. Movies like this don’t have to go to theaters to make money, they usually make good money post theatrical anyway. It’s not like these movies break the bank to make, so a theatrical release isn’t essential to their success. Universal must have thought so, to greenlight this sequel. This is pretty much a direct sequel to “Curse,” again following Nica as she is moved into a mental hospital because no one believes her about Chucky. Unlike previous sequels, this movie is not easy to predict. It takes a while to realize exactly what is going on in this movie, and that is exciting. It’s rare for a seventh movie in a horror franchise to take chances with its mythology and not rest on its laurels, but “Cult of Chucky” does that. By the end of this movie, you will be interested to see what happens after this movie ends.